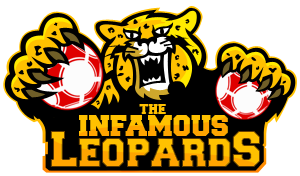 The Infamous Leopards (TIL) is a Dutch team, managed by GM-Rob. TIL currently plays in the serie VI.778. Home matches are played in The Savanna in Zuid-Holland. At February 20th 2005, Rob's jongens was founded. They started right after the second league matches in season 14. Rob's jongens were officially recognised by the HFA and were allowed to replace an ownerless team in X.982. The first season was a huge learning experience for this team. Nevertheless Rob's jongens came in 4th. After this season "The jongens" won 3 championships in a row, which brought the team to 7th division. Rob's jongens finished at the 7th place and relegated back to 8th division. The team has gained a lot of experience in 7th division and easily won their league and gained promotion to 7th division.After the team has won his 4th championship, the manager decided to change the team name to Teachers Chalk. Teachers Chalk started in VII.858 after they just won their 8th division. With only 1 match to go, Teachers Chalk was still in the race for the title. After losing the last match, Teachers Chalk finished 3rd. In the next season the road to the championship was very easy for Teachers Chalk. In 6th division the impossible happened and Teachers Chalk won a championship again! While just missing direct promotion, the team had to play a qualifier against FC Bajadas and won! In season 23 Teachers Chalk came in a very difficult league and only managed to win 2 matches. They relegated back to 6th division. After this season the team name was again changed. The new (and current) team name was The Infamous Leopards. The Infamous Leopards won VI.461 in their first season and they promoted directly back to 5th division. The first season in V.118 was expected to be a difficult season. And indeed, The Infamous Leopards had to fight against relegation. They ended up in sixth place and won the qualifier against de Karre United. Their second season in V.118 was supposed to be more easy, but it wasn't. TIL was in the lower regions of the league all season long and couldn't do anything to prevent the team from relegating back to sixth division for the second time. All players were sold and coach IJsbrand Dooms bought a complete new team for division six. In the first season in VI.778, the players had some trouble finding eachother. This resulted in an early cup knock-out and a seventh place after 5 weeks of competition. TIL fought back and after a very exciting season they finished third! The second season in VI.778 TIL did a great job. TIL took the lead in round 4 and kept that position for 7 weeks. Then the team started to become nervous and lost their first position in round 12, took it back in round 13 and lost it again in the final round 14. TIL fought a great battle with Laing's Nek United, but lost it in the final round. TIL reached the fourth round of the KNVB Beker. Last season, the third season in VI.778, was a very succesfull season for TIL. TIL reached the seventh round of the national cup, beating 3 higher ranked opponents. TIL only suffered one loss in their league and won their league quite easy with a gap of 13 point to number 2, Laing's Nek United. This resulted in auto-promoting to division five. Next season TIL will play in V.241. With non-relegation as main goal. TIL has five icons. Two of them are former players of TIL currently playing somewhere else, the other three are retired and in the Hall of Fame including one coach. Jacek Szczucki is a goalkeeper from Poland. He was bought for only 39000€ and sold 10 months later for 3226000€, wich was a clubrecord for a very long time. He played 39 matches and had 23 clean sheets, which still is a clubrecord. After an adventure in Spain Jacek returned to Poland where he played for Białe Wilki. His current owner is Fenerbahce Istanbul from Österreich. Wubbo Heusken was bought when he was 17 for 714000€. Wubbo Heusken is also a goalkeeper. He played 23 matches and had 12 clean sheets. Wubbo Heusken was closely watched by the Dutch U-20 scouts, but never made it to the team. Wubbo was sold for a fee of 3185000€. After an adventure which brought Wubbo to Rossiya, Estonia and back to Nederland he currently plays for Mosebacke BK from Sverige. At May 25th 2006 Dietrich Haralanoff, was the first player to be promoted to the TIL Hall of Fame. He decided to retire when he got a couple of major injuries in a row. He played 62 matches for The Infamous Leopards and is currently working in the cafeteria in The Savanna. Dietrich was the first player to be a member of TIL for over 400 days and was a part of 3 championship teams. At January 21st 2007 Bekim Pirjavec, retired. He was instantly awarded a place in Hall of Fame. He's the first coach to recieve a spot in the TIL Hall of Fame. Bekim won a title in VIII, but relegated the next season from VII to VIII. Back in the VIII he won his second title. Bekim is currently a sales director for TIL. Norman Dunn was a member of 7 championship teams and scored 79 goals in 111 matches. He was a member of the team for exactly 1000 days. Norman Dunn won the golden boot in season 17. He scored 18 goals including 5 hattricks. Because of this unique performance he earned the nickname Mr. Hattrick. He's currently active as a player agent. At the age of 40 Jirí Baštar had won 5 title with TIL. He won 2 titles as a player and 3 more as a coach. Baštar is currently working as an actor. His specialty is football movies. Four players played for their National team or National U-20 team, while they played for TIL. At March 30 2007 Jose Ibarra became part of Guatemala U-20. He was the first ever player for The Leopards to become part of a national team. Jose Ibarra made his debut for Guatemala U-20 at April 6th 2007. He played 10 caps and scored 1 goal while playing for The Leopards. Jose Ibarra was sold at 22-10-2007 for a transferfee of 1 787 000 €. He currently plays for Te Bañaste FC in Chile and his national team. At November 5th 2008 a 17-year old boy from Tanzania joined The Infamous Leopards. His name: Charles Sumari. Charles Sumari allready played 3 caps for Tanzania U-20 when he was bought by The Infamous Leopards. He made his debut on October 17th against U20 Malta. He currently has a total of 4 U-20 caps and 15 NT caps. July 8th 2009, Hamidi Oracho joined The Infamous Leopards. Hamidi Oracho played 19 matches for Kenya U-20 when he signed for The Leopards. He made his debut for Kenya U-20 on December 12th 2008 against Polska. Hamidi Oracho played his last U-20 match on August 28th 2009 against Republica Dominicana. A few weeks later, on September 17th 2009 Hamidi was selected for the National team. One day later he made his debut and played the first 45 minutes against Italia. He played a total of 22 U-20 caps and 2 goals. His total of NT-caps is 1, scoring no goals so far. Maskini Nduria was promoted from Coast Warriors' youth team 3 days before he joined TIL at November 25th 2009. Only two days later, on November 27th, he made first appearance for Kenya U-20 against Côte d'Ivoire. He played 5 matches for Kenya U-20 team and scored 0 goals so far. This list contains the club's topscorers per season for goals in league matches. If the player is also the most productive player of the league they recieve the Golden Boot. In the first year The Infamous Leopards trained goalkeeping. TIL earned a lot of money with this, especially with using skilltrading. The two best goalkeepers trained are Jacek Szczucki and Wubbo Heusken (both noticed before under Club Legends). After one year young wingers were bought and training was changed to wing. Hilco Schols vollunteerd to coach the team untill a better coach was found. With Patrik Månsson the team won 2 titles and they promoted from X to VIII. Bekim Pirjavec won a championship in the VIII and got promoted to VII, then relegated from VII back to VIII and then won the championship in VIII again to promote back to VII again. Added to the Hall of Fame at 21/01/2007. He came to The Leopards as a player on 29/01/2006 and was the first player to become coach. Jirí Baštar won 3 championships as a coach and 2 as a player. Added to the Hall of Fame at 08/10/2008. IJsbrand Dooms was the the first Dutch coach in more then 3,5 years. He quit his job as a coach because he was spending to much time with his girlfriends. Dooms is still active as a forward for TIL. Leo Oostrom stood up when previous coach IJsbrand Dooms quit his job. He was bought as a player by TIL on January 13th 2009. Oostrom is still active as a goalkeeper for TIL. Kari Karppanen was bought as a player with the intention of becoming a coach. He joined the TIL squad at the very end of 2009. He's still on the playing roster for TIL, but most of the time he's on te sideline, coaching his team. 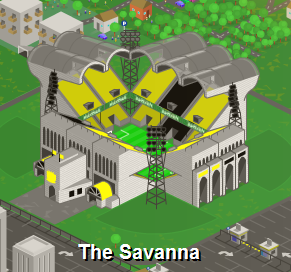 The Infamous Leopards play their home games in The Savanna. The current capacity of The Savanna is 52000. This page was last edited on 22 May 2011, at 18:12.